According to my inventory count, I currently have 155 blushes in my collection. And yet I still wish I had more…! 😛 The highest brands on my wish list are Sleek and Colour Pop – I can only order them online so it’s a case of hard to get = want them even more. Blushes do tend to take up quite a bit of space (I have good intentions to depot more of the Shiseido and bulky baked blushes), so in order for me to appreciate everything I have, I rotate my collection, similar to what I do for summer / winter wardrobe. It was helpful for me to pull out all of my blushes for this entry – now my fall / winter blushes have been extracted and set aside for the season. It’ll be mostly peach / orange / coral blushes from now on! What is your favourite brand for blush? Any brands that I don’t have that you think I should try? Ahhhhh I love stash pics!! Whoa, that is a lot of blush. Last week I put most of my blushes into one container, and it is smaller than a shoebox 😀 Yes, they all fit. The Cargo blushes are beautiful, but I confess that the tins annoy me b/c I can’t get them open sometimes. I swapped away the one Cargo blush I had yrs ago! I have a couple Lancôme blushes that I love; have you tried any? Hmm another brand I have that I don’t see in your stash is Vasanti. I just have one but it’s one of my faves. See, the Cargo packaging never bothered me, but I know lots of people hate them. They open just fine for me. *shrug* I quite like their aesthetics actually! 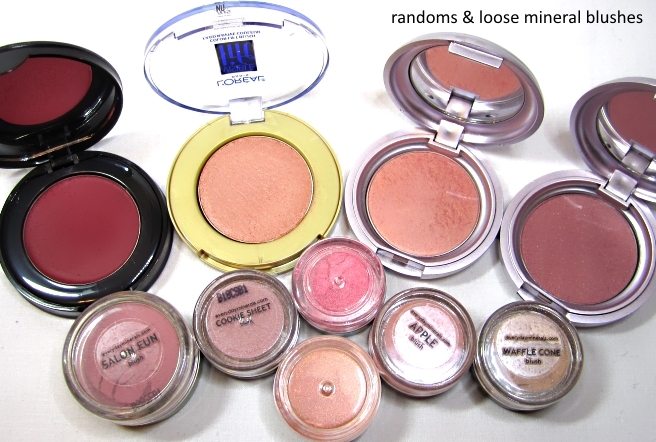 I’ve never paid mind to Lancome blushes – I actually can’t even envision what they look like! I’ll have to have a look see. I own a few Vasanti eye shadows and I was completely underwhelmed! But maybe their blushes are better quality? I’ll have to look at them – I’ve only tried a handful of Vansanti products and my favourite has been the face scrub. I think I just had a bad experience with a Cargo e/s and blush. Both got stuck and I was just…AAAAARGH. But I do like the modern and minimalistic look. Lancome blushes were my first high-end blushes! (My mom is a Lancome person…does it not seem like everyone’s mom is either an EL or a Lancome person and not both? !…and I would borrow her blush.) Last year I picked up a couple, which I need to swatch. Before I just used the GWPs since they’re always giving out little blushes. I haven’t tried the Vasanti e/s but I do generally like their lipsticks and the one blush I have is nice! Keep posting your stash pics, LOOOOVE. So I just googled Lancome blushes and I realize why I didn’t pay much attention to them… they are in rectangular pans! I used to have this weird preference for round pans for blushes. I just feel like blush brushes fit into round pans better – hence why I started out with MAC and Cargo blushes. It wasn’t until Shu and Shiseido that I started to open up to rectangular and square pans. I’ll have to see if there are any interesting shades Lancome has that I may not have (but let’s be real here, I’ve pretty much covered the spectrum of blush shades in my collection, save for the outlandish colours like purple). Hee! Both brands I recommended to you have square pans. Sorry! The Vasanti ones are a bit annoying, too, because they’re the size of eyeshadow pans. Wow, what a collection! Glad to know I’m not the only blush hoarder out there 😉 You should definitely try colourpop blushes (i know its a hassle to order online, but so worth it!). They are one of my new faves (and such a great price!). Yay, blush boarders unite! 😀 Do you have a review on your blog on the Colour Pop blushes? Which shade is your favourite? I recently just ordered another that I haven’t received yet. But they are a unique formula. They are creamier than a pressed powder, but not completely a cream blush. They are kind of ‘bouncy’ is how I would describe it. They have a wide range of colors too! The one in my previous post that I linked looks kind of bold and scary, but I have worn it so much! If forced to choose, I would say my favourite high end is Illamasqua, and drugstore would be Milani. I actually want to try more drugstore brands – for some reason I haven’t delved too much into them. Wow what a collection! I love my staple Mac blushes! This makes me so happy lol. I LOOOVE blushes so much ❤ Such an amazing darn collection!! Jealoussss!!!! Wow, that is an impressive stash of blushes! I only own 8 haha! Wow thats a lot of blushes! They are all so pretty! My top two favorites are the Milani Rose blushes and the new Urban Decay Afterglow 8 hour blushes! Though I have never tried any Mac, I want to hop on that bandwagon. Do you have a recommendation for a first Mac blush??? First MAC blush… hmm, I would recommend one of the Mineral ones! I really like the colour Gentle. Dainty is also very pretty! I’ll definitely have to check them out! My favorite blush brand has been Benefit. Hervana and Rockateur have been my mainstays for a few years now. Though, I’m starting to get more into cream blushes and I LOVE Becca’s Shimmer Souffles and Jose Maran’s Coconut Cheek Gelees. I have Rockateur on my wish list based on your rec! My first ever Benefit box blush was Hervana, surprisingly. Then I bought Dallas and I really like them! I am not a huge Benefit fan typically but their blushes are quite nice. And they contain SO much product! Your blush collection is amazing! I loved reading your old entries of all your blushes! They really created new wish list items lol! Ohh Thank you! Oops, gonna make you spend then! Lol. Can never have too many blushes can you?! Would like to see more of yours – do you have posts on specific ones? Hmm favourites.. it’s hard to pick! I love the ones from Nars most I think. Mac are great too & really loving the liquid blushes from Make up Revolution. Every Make Up Revolution product I’ve seen posted by UK bloggers look stellar! And they’re so reasonably priced too! That’s a beyond impressive blush inventory! I only own a handful, but I’m fine with that. Blushes are just the best, aren’t they? I love it more than lipsticks! Have you posted pictures of your collection by any chance? You have a gorgeous collection!! 😳 Thanks for sharing. I don’t own a single Chanel item! I had an eye shadow once but gave it away. I think Chanel blushes have been compared to the Bourjois ones, since they’re the same company. OMG Amazing collection. Spectacular. OMG OMG OMG. LOVE LOVE LOVE. LOVE LOVE. Thank you! 😀 Are you a blush fiend? What’s your favourite brand for blush, what shades? I only have the one Tarte blush (Exposed, cuz everyone and their grandmas were gushing over it) and I was so underwhelmed! Is there something wrong with me?! I may need to try another colour? What colour do you recommend from Tarte. sooooo here’s the unspoken question we all want to know: what’s your desert-island blush pick? I threw it in there for the photos when you gave it to me lol! I took the picture on Sunday 😀 But I haven’t actually tested it on my cheeks yet! Will test it on the weekend possibly! I LOVE the Cheek Pops! Clinique launched a whole bunch of new colours that I want to get my grubby hands on. They are NOT just pretty packaging – totally worth picking up one! Or two… or three…. If I’m on a deserted island, the last thing I’d be thinking about is blush… BUT, if I had to choose ONE, I’d say, Cargo Tonga. It’s a matte neutral shade that’s a no brainer. Ugh, you just made me choose one and now the other blushes are sad and jealous. Ooh those blushes are soooo pretty. “like candy for my face” hehe, totally agreed. Wow! Now that is an awesome blush collection! OMG, I think I just died and went to blush heaven! Your stash Stash (lol) is incredible! Seriously, I’m jealous. Those MAC LE from the Disney release are gorgeous and I spotted a Burberry blush as well as the Carmindy ones! Loved the Carmindy blush but sadly I think she has a new line now apart from Sally Hansen. I want them all, now! 🙂 I’m in a blush coma. My tiny blush collection does not compare. I love those Carmindy blushes so much! They’re amazing quality for the price! So sad the line is discontinued. I know, I know, no human needs this many blushes! I did purge quite a few and there are more that I should purge. I just love blushes so much… sigh.